Q. During rounds, a nurse finds that a client with hemiplegia has fallen from the bed because the nursing assistant failed to raise the side rails after giving a back massage. The nurse assists the client to the bed and assesses for injury. As per agency policies, the nurse fills out an incident report. 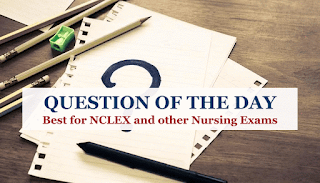 Which of the following activities should the nurse perform after finishing the incident report? A. Attach a copy to the client's records. B. Highlight the mistake in the client's records. C. Include the time and date of the incident. D. Mention the name of the nursing assistant in the client records. Explanation: The nurse should include the date and time of the incident in the incident report, the events leading up to it, the client's response, and a full nursing assessment. To prevent legal issues, the nurse should not attach the copy of the incident report to the client's records. Also to prevent litigation, the mistake should not be highlighted in the client's records. As the client report is a legal document, it should not contain the name of the nursing assistant. Thanks nursing art academy. Your post is The Nursing Process topic.I am interested about nurse job. I am also interested about mental health nurse resume. are you help me about this? This is very informative post about The Nursing Process topic. I think this site is really good at about it.This is one of the best posts I came across up to now. Seasonal laborer jobs at BLM recreation sites is great concept in modern time , it help many people to getting new jobs makeup artist bio is essential for makeup artisthelpful link will help you to know more.